The Bellefonte Arts & Crafts Fair will return to the streets of downtown Bellefonte after seven years in Talleyrand Park. Photo via Historic Bellefonte Inc. 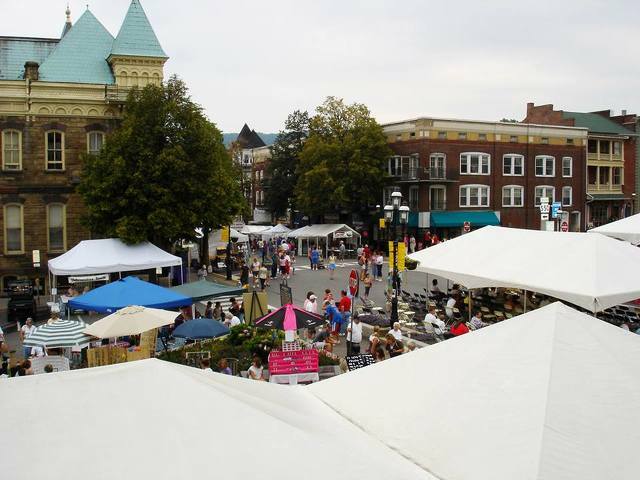 The Bellefonte Arts and Crafts Fair is one of the biggest weekends in Bellefonte, and after a few years at Talleyrand Park, the festival is back downtown on Friday and Saturday, amongst the historic buildings and shops that make Bellefonte unique. And, Talleyrand Park is still just a short walk away for those who are looking to take a few moments to walk along Spring Creek. “The Bellefonte Arts and Crafts Fair is coming back to where it originated 35 years ago,” said Denise Snook, assistant director of the event. “For 27 years, the fair was on the streets of downtown Bellefonte before moving to Talleyrand Park where it has been held for the past seven years. We are excited to bring the fair back to town. Organizers appreciate that the setting in historic Bellefonte fits well with the artistic atmosphere of the event. Snook said she expects a large crowd for the event, because there is so much to do. Visitors can view the wares of more than 70 artists from Pennsylvania, Florida, Maine, Maryland, Massachusetts, Michigan, Ohio and Virginia. The food court, located in the municipal building parking lot behind First National Bank, will offer a wide variety of options. Attendees are invited to drop by the information tent and register to win a free basket of goods from local businesses. Parking downtown can be tight with streets closed off and so many people in town, but the fair will be offering a free shuttle from the Bellefonte Area High School parking lot, with continual runs from 10 a.m. to 8:30 p.m. Aug. 10 and 10 a.m. to 5:30 p.m. Aug. 11. For the full lineup of entertainment, activities and vendors visit bellefontefair.org.